There's a new challenge at House Mouse and Friends Monday Challenge! Challenge # 141 begins today and runs through April 6th at midnight. Yep, we will all be coloring up those Easter eggs this week! One Lucky Winner will receive a fab $10 Gift Certificate to shop at H M STAMPS. JS LTD., is offering a a £10 voucher to One Lucky Winner for spending at www.joannasheen.com (in full or part payment) for some crafting goodies. The design team has come up with some beautiful cards/projects for your inspiration. So, hop on over to the House Mouse blog and have a peek. We can't wait to see what you come up with for our EASTER CHALLENGE. what a gorgeous card and such a great an fun image Sue. Just darling Sue. The image is cute as can be and your coloring is spot on. The paper and additional eggs all add something special to the entire card. Wishing you a fun week ahead coloring your eggs. Gorgeous and cute Sue. I love the image and wonderful colouring. 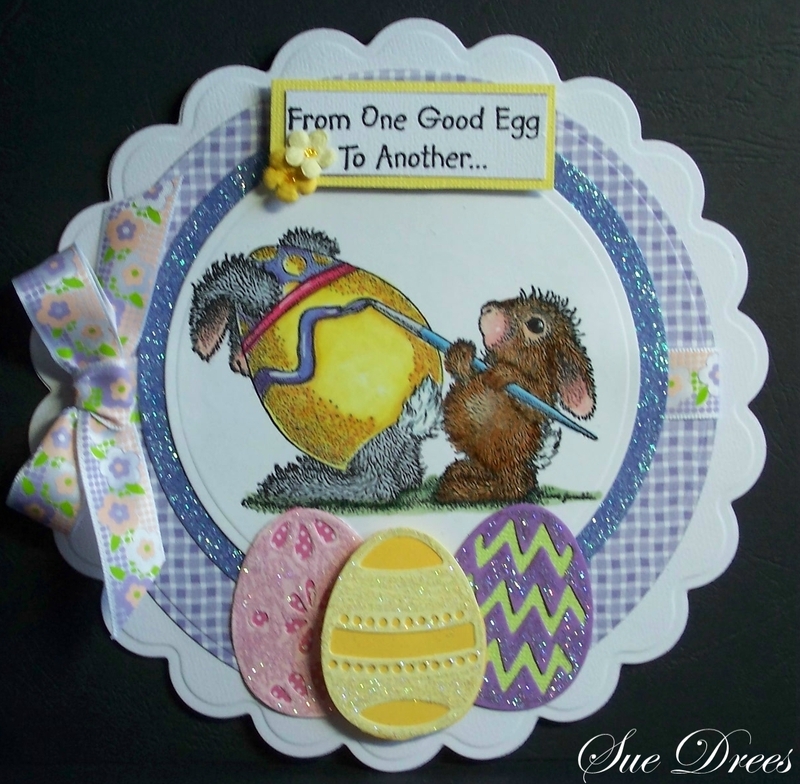 Gorgeous card, Sue the image is very cute and the papers and the eggs you have added are so beautiful. Hi Sue! What Fabulous use of eggs for embellies. Love the layers and shape and how you've colored this adorable image. We used the same sweet image and even stuck to circles. heheh. Great minds think alike. 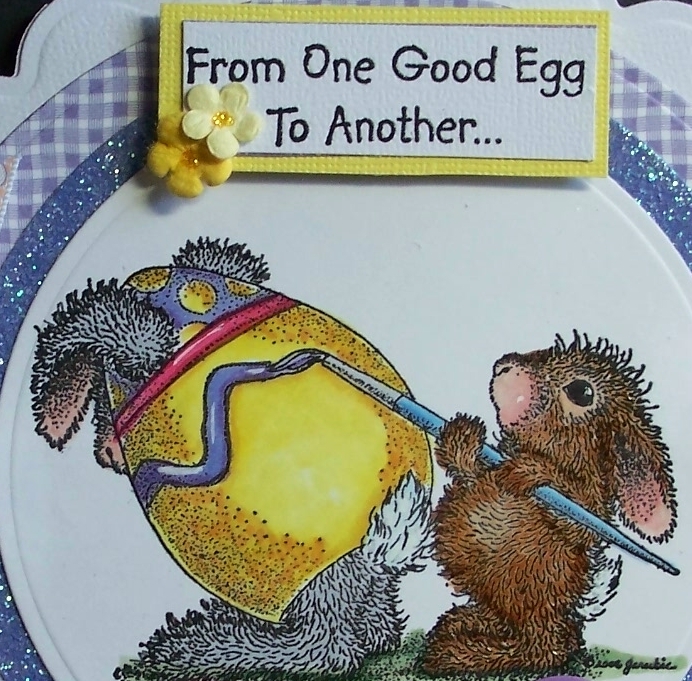 Gorgeous Easter card, love how coloured those eggs , love the whole thing! Have a happy easter my dear friend! A gorgeous card Sue, I love your design and fabulous papers. 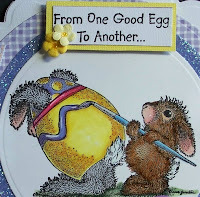 Your beautifully coloured image is adorable and fantastic details - those glittering eggs are stunning!! This is so cute, I love the image you’ve used and the colours too.